Simmer the onions over low heat with a ½ cup of hot water, stirring constantly. When the water has evaporated and the onions are slightly brown, add your oil and cook over low heat until these are translucent. Add your berbere, stirring constantly. Add more water to maintain a paste-like sauce and keep this going for a ±10 minutes. Be careful not to burn the paste as this will make the berbere bitter. Then, add the garlic, ginger and chicken. Add your water and stir, until it cooks down. Keep adding more water when necessary. Remember, it should always be hot water. Keep this up for at least 30 minutes, letting the sauce simmer intermittently (without covering the pot). Add white pepper and salt and stir. Then, add your kibbeh. With a bit of water, let it simmer for 15 more minutes. Check in to see that the sauce is not sticking to the bottom of the pot. Make little slits in the egg and put them into your sauce. Cook long enough to heat them through. Cooking and preparation by Million Dawit Messfin. Recipe courtesy of Million Messfin. Million Messfin is a chef and food enthusiast, currently living and working in Dubai. You can find him doing what he does best at Gursha Dubai. 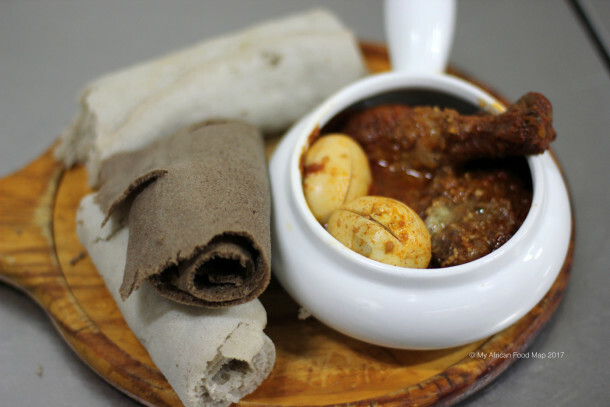 “Doro wot is Ethiopian typical dish. And it takes a long time to wash the chicken. We have to wash the chicken with lemon and salt overnight, so the taste – the original taste of the chicken doesn’t have to remain on the pot. So we wash it cleanly with lemon and salt. Then, I drain that one. Then, I marinate it with garlic and white pepper and with rosemary. I cover it; I put it in the fridge overnight. So we’ll have our garlic, ginger, salt, pepper and Ethiopian butter. The butter has a lot of taste inside. So that’s the key secrets we have. And berbere. We have the berbere, which is – we call it “red chili.” But the berbere is like… it has a lot of spice in it, but the base is, chili powder. So that’s the secret ingredient we have. It’s very spicy, and tasty too.